Sri Pada (also Adam's peak; Sinhalese Samanalakanda - "butterfly mountain", Tamil Sivanolipatha Malai, is a 2,243 metres (7,359 ft) tall conical mountain located in central Sri Lanka. It is well-known for the Sri Pada "sacred footprint", a 1.8 metres (5 ft 11 in) rock formation near the summit, in Buddhist tradition it is held to be the footprint of the Buddha, in Hindu tradition that of Shiva and in Muslim and Christian tradition that of Adam. The mountain is located in the southern reaches of the Central Highlands, in the Ratnapura district of the Sabaragamuwa Province - lying about 40 km northeast of the city of Ratnapura. The surrounding region is largely forested hills, with no mountain of comparable size nearby. The region along the mountain is a wildlife reserve housing many species varying from elephants to leopards, and including many endemic species. Access to the mountain is possible by 6 trails (Ratnapura-Palabaddala, Hatton-Nallathanni, Kuruwita-Erathna, Murraywatte, Mookuwatte & Malimboda). Out of these the Nallathanni & Palabaddala routes are the most popular. Kuruwita-Erathna road is somewhat popular as well. The other 3 roads are almost obscure. It joins the Palabaddala road midway through the ascent. Buses connect the final nodes of Nallanthanni to Hatton, Palabaddala to Ratnapura & Erathna to Kuruwita. There after it's a difficult journey through the forest on foot. Most of the pilgrims use Hatton route as the journey on foot can be reduced by more than five kilometers even though the slope of this route is much greater than other routes. Due to its historical significance to the various peoples that inhabit the region, the mountain, itself, is referred to by a variety of terms. Sri Pada is the term, derived from Sanskrit, used by the Sinhalese people in a religious context. This name is also understood in Pāli, and may be translated roughly as "the sacred foot". It refers to the footprint-shaped mark at the summit, which is believed by Buddhists to be that of the Buddha. Other traditions assert that it is the footprint of Adam, left by his first entrance into the world. Shivanolipatha Malai and Shiva padam are two Tamil names holding similar meanings, but both refer to the footprint as being that of the Hindu deity Shiva rather than that of the Buddha. 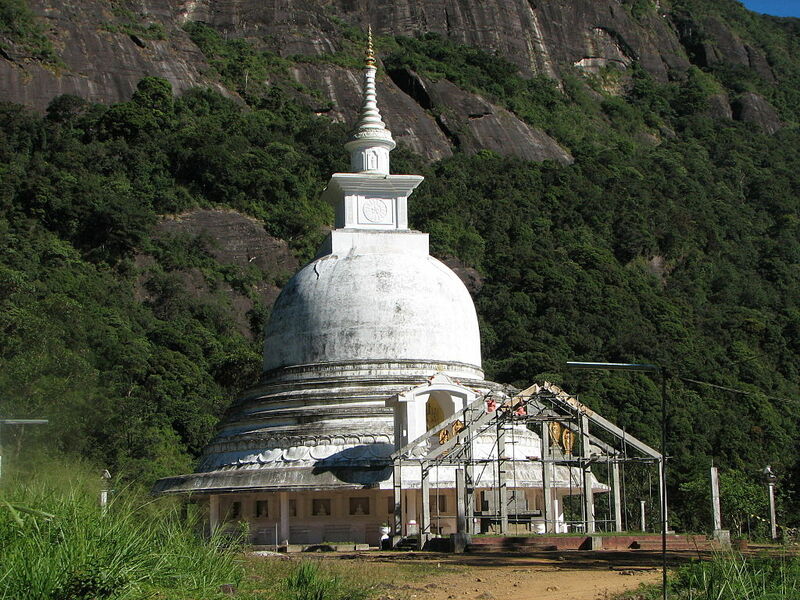 The Sinhala name of the mountain is Samanalakanda, which refers either to the deity Saman, who is said to live upon the mountain, or to the butterflies (samanalayā) that frequent the mountain during their annual migrations to the region. 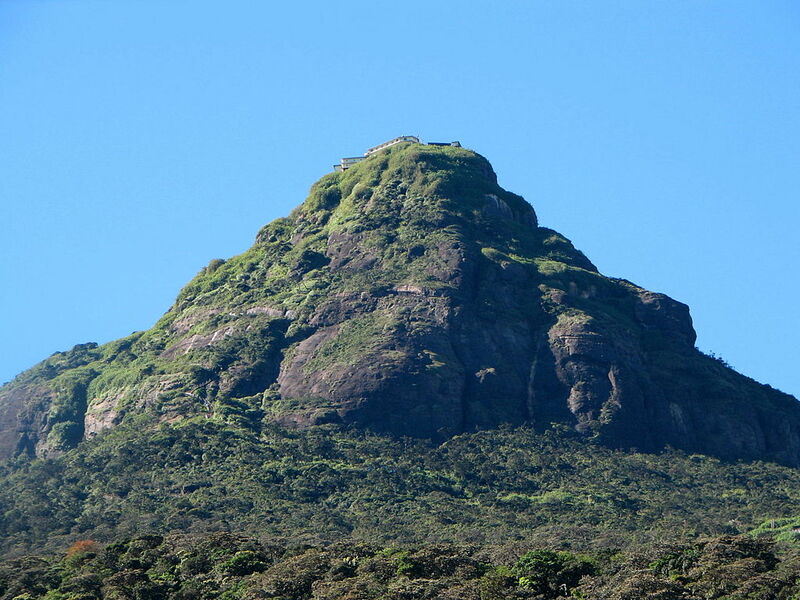 Other local and historic names include Ratnagiri ("jewelled hill"), Samantakuta ("Peak of Saman"), Svargarohanam ("the climb to heaven"), Mount Rohana and other variations on the root Rohana.